If you are looking for an affordable Italian restaurant to dine in or order from that doesn’t sacrifice quality for great prices, then you won’t want to miss Prezzo. At Prezzo you will find a wide variety of delicous Italian food such as pizza, pasta, salads, grilled foods, side dishes, and much more. You can even use Prezzo vouchers and discount codes to get even lower prices when ordering or dining in! The first Prezzo was opened in Central London in the year 2000, and was established by Jonathan Kaye. The company currently operates over 180 restaurants in the UK alone, and very often uses older buildings with architectural value to open new stores. Jonathan is the son of Reginald Kaybe and the nephew of Philip Kaybe, who were both well established in the restaurant industry in the sixties. Johathan hired his cousins Adam Kaye and Samuel Kaye to be part oft he board of directors, and the two later went on to find Ask restaurant and Zizzi. By 2006, Prezzo already owned 73 restaurants, and then decided to expand its reach even more by reducing their share prices. This action paid off well, as it raised over 7 million pounds through share placing. By the end of 2006, the company grew a staggering 45% and turned over 54 million, with pre-tax profits growing year on year from 6.1 million to 8.7 million. The company continues its growth, with a reported 17% increase in profits in the 4th quarter of 2011, and continues to open new restaurants regularly. Their hard work has paid off big with customers as well, earning them the Best Casual Dining award in 2011 (MIDAS). They also won the Best Italian Restaurant Chair award in 2007 (PAPA), and the „Best Pizza Chain“ award by BBC Olive in 2009. 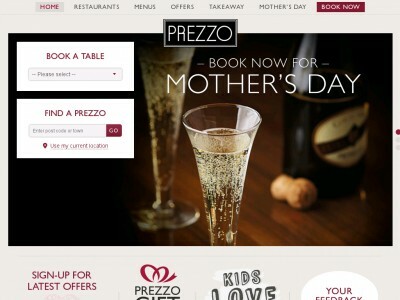 The company also allows their customers to use Prezzo discount vouchers (and offers their own specific Prezzo voucher codes as well) to receive discounts on their meals. Make a reservation for a table directly through their website or by phone. Once you are there, make your order as you normally would. Once you have finished eating, hand your voucher over to your waiter or waitress when you are paying the bill. ...and much much more! Just don’t forget to pick up your Prezzo voucher codes to save even more when you're eating out or ordering in! Prezzo wants to keep their customers in the know about whats going on within the company, on details about sales and promotions, and in general what they are up to. In order to accomplish this, they are active on multiple social networks that allow you to get an even deeper look within their company. Be sure to check out the company social networks regularly, as you never know when special Prezzo vouchers or discount codes might be waiting on you! Prezzo wants you to have access to their delicious products regardless of where you are, which why they have developed mobile applications that allow you to place your order from anywhere! You can browse menus, and pay by Paypal, debit card, or credit card, download Prezzo vouchers, as well as split the bill and add a tip directly from the app! Prezzo prides itself not only on its wide variety of food (which can all be purchased at even lower costs, so don’t forget your Prezzo voucher codes! ), but also on their “Guilt Free” section, which contains only main courses, salads, and desserts that contain only 500 calories or less! This is perfect for people dieting or trying in general to watch their weight, and allows you to enjoy fine Italian dining without having to have a bad conscience! Prezzo also offers a winter menu, a dessert menu, a lunch set menu, children’s menus, as well as party menus for when you are planning your next your next big event. The website also has easily accessible nutritional information on their products, along with allergen information as well. So what are you waiting for? Grab your Prezzo voucher code from our site today, and start saving big on your next Italian meal! Buy now online at www.prezzorestaurants.co.uk. If there are 2 things I love, it’s Italian food and saving money when buying it! Ok, that list isn’t all that I love in this world, but you will definetely love the amount of money that Prezzo vouchers can save you on all of the wonderful Prezzo offers! Whether it’s pizza or pasta, a Prezzo voucher code can save you more when you’re enjoying their great meals (browse the Prezzo.co.uk website to see what I’m rattling on about!) So stop paying more than you need to for your favorite Italian cuisine, and grab your free Prezzo discount vouchers today!